On May 12, 1896, Fort Missoula's 2nd Lieutenant James A. Moss received permission to organize the 25th Infantry Bicycle Corps, the first of its kind in the country. Moss, a native of Louisiana and a West Point graduate, was an avid cyclist who set out to thoroughly test the practicality of the bicycle for military purposes in mountainous country. Training trips consisted of a series of rides of increasing lengths, including a trek to Lake McDonald in the Mission Mountains. In August 1896, Lieutenant Moss was ready for a major expedition: a trip from Fort Missoula to Yellowstone National Park and back - 800miles in all. The Bicycle Corps left Missoula on August 15. Moss kept a detailed log of each day's progress, noting the types of grade, road conditions, and weather that the Corps encountered along the way. The Corps arrived in Yellowstone on August 24, 1896. Motherf***ing Bike [HD] - NSFW or children. You've been warned. Yay Bikes! and a Movie is April 2, 2012 - "Breaking Away" on the big screen! 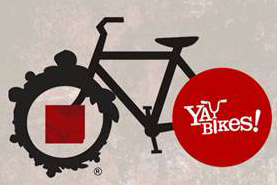 Join us for the inaugural Yay Bikes! membership meeting. We’re celebrating the 200Columbus Bikecentennial by setting a goal to get 200 members by April 2nd. Come mix and mingle with your fellow riders. 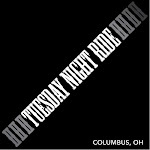 We will be discussing our Year of Yay 2012 rides, Bike the C-Bus and other great rides! Please RSVP to Meredith@yaybikes.com by 3/24/12. Wild Goose Creative, in partnership with Yay Bikes!, Make Believe Monsters, Bike OSU, and Jeremy Slagle Design, announces a call for entries to a bicycle-inspired poster show called Pinchflat 2. Posters will be displayed and sold at Wild Goose Creative and www.pinchflatcolumbus.com starting with a poster party on Saturday, May 5, 2012 and continuing through the end of May. All posters will be created by artists in Columbus or central Ohio. Artwork included in the poster show will encourage bike riding, celebrate the art and craft of bikes, or invite thought about bikes as an important way to get around Columbus. Artwork might also be designed to persuade people to get on a bike in the first place! Posters should be silkscreened, etched, lino cut, or letterpressed and should measure at least 11×17 inches. Each poster will be priced to sell at $30 and will be displayed along with between 20 and 30 other posters. Artists will be responsible for having their artwork printed and delivered to Wild Goose Creative for exhibition and sale. Wild Goose Creative and Pinchflat will retain the right to handle sales of posters for the duration of the exhibition. 20% of proceeds will be retained by Wild Goose Creative. Submit your artwork in PDF or JPG format via email to: bikemonth@wildgoosecreative.com before March 15. Once a proof is submitted, notifications of show entry will be provided within 48 hours of receipt. A run of at least 20 posters must be printed and delivered to Wild Goose Creative by May 1. Any questions should be directed to: bikemonth@wildgoosecreative.com. It will not be news to anyone who is reading this that the United States remains in the midst of the deepest economic crisis in my lifetime. (I guess it turns out that you can’t start two major wars while cutting taxes and failing to regulate financial institutions, at least not without paying a steep price. Surprise.) Getting out of this mess and becoming more economically resilient will require a basket of solutions, including a serious look at the way we have been growing our cities and towns. Indeed, my friend Charles Marohn and his colleagues at the Minnesota-based nonprofit Strong Towns have made a very compelling case that suburban sprawl is basically a Ponzi scheme, in which municipalities expand infrastructure hoping to attract new taxpayers that can pay off the mounting costs associated with the last infrastructure expansion, over and over. Especially as maintenance costs increase, there is never enough to pay the bill, because we are building in such expensive, inefficient ways. This week, Strong Towns has released a substantial new report analyzing data and arguing that we must change our development approach if we wish to end the current economic crisis. In particular, we must emphasize obtaining a higher rate of financial return from existing infrastructure investments, focusing on traditional neighborhoods where large public investments in infrastructure are currently being underutilized. Bike & Roll: The Best Way to Tour New York City! The Manhattan Waterfront Greenway is a continuous dedicated bike path circuit that extends around the entire island of Manhattan, and is part of the Hudson River Valley Greenway that extends north to Albany. It offers a safe and easy way to get up close and personal with the city's best sites. Most of the circuit is car-free; all of it is fun, offering a relaxed riding atmosphere for bikers of all ages and experience levels. The Manhattan Waterfront Greenway encompasses a bountiful assortment of famous parks and destinations, including Hudson River Park, The Battery, Governors Island, Brooklyn Bridge Park, East River Waterfront Esplanade, Ellis Island, Liberty Island, and Liberty State Park. These parks include museums, art exhibits, boat tours, bike tours, restaurants, historical buildings, and famous landmarks. Most of the waterfront parks are accessible by bike along the Manhattan Waterfront Greenway or by water transit within the waterways. As a coastal route, the Greenway provides convenient access to water transit, allowing riders to connect to all five New York City boroughs and the Manhattan waterfront park system by bike. Most Bike and Roll locations are near NY Water Taxi landings. Bike and Roll is America's premier bicycle rental and tour company, serving thousands of satisfied customers each year. Bike and Roll was established in 2001, and operates locations in San Francisco, New York City, Chicago, Miami Beach and Washington D.C, with plans to expand into other cities and parks throughout the United States, Europe, and Asia. Biking keeps us young in spirit! And there is no better way to get around, see new things, and stay healthy and active. The perfect way to explore New York City is on a bike. Bike and Roll supplies free maps for its many self-guided tours, along with supplies, equipment and all the assistance you will need to explore New York City on your own or with your family and friends. Whether it's a trip across the Brooklyn Bridge, biking the Greenway, exploring Governor's Island, or hopping on and hopping off all round the City, Bike and Roll will provide the equipment and expertise to make your outing fun, safe, and memorable. Bike and Roll is a "green" company, helping the Earth's environment by encouraging alternative, safe and healthy modes of transportation. Make a reservation to explore the many facets of New York City on your own, at your pace, and with a Bike and Roll bike. I'm a cyclist, trail runner, journalist, winter enthusiast, photo documentarian, former (and hopefully future) Alaskan and endurance junkie who likes to go where the wind takes me. I've been blogging here since 2005, primarily as a personal scrapbook for my outdoor adventures. 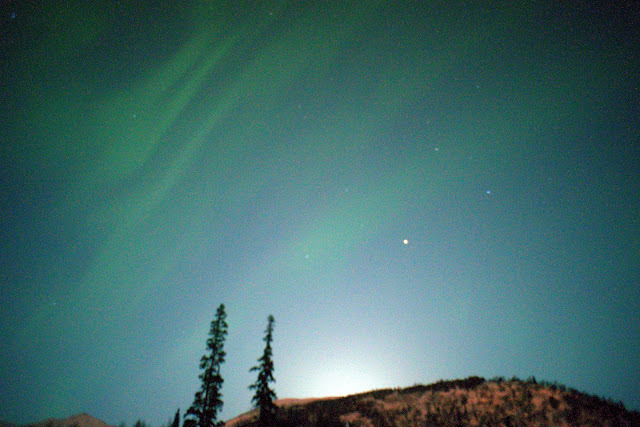 It's beautiful when you're commuting to the airport beneath a full moon and the strongest solar storm since 2004, witnessing luminescent waves of white and green aurora despite layers of light pollution. Idéale saddles are among the least understood bicycle components given their historical prominence and sometimes exorbitant value. The dizzying array of models produced continues vexing even the most ardent collectors, who seem to enjoy the punishment received when combining obscurity of fact with broad product offerings and potential stratospheric price appreciation. The celebrated yet largely unknown Idéale saddle deserves its enigmatic reputation every bit proportionate to its modern popularity and then some. Had it not been for a collapsing French cycling industry and distinct inability to move beyond core markets, Idéale might even be around today. 1890 in France was a wonderful time and place for transportation breakthroughs. Armand Peugeot and Emile Levassorgave motorized four wheelers their first automobiles, while motorized two wheelers had Marquis Albert De Dion and Georges Bouton finalizing the motorcycle engine before emerging as the world’s largest car producer by 1900. Bill, Emily and I spread the message of bicycle advocacy to a ton of the 200+ attendees of the Columbus Yelp Helps event on Wednesday evening at the Westin Columbus. We met a lot of people who are interested in our mission and discussed partnerships with many companies and organizations. 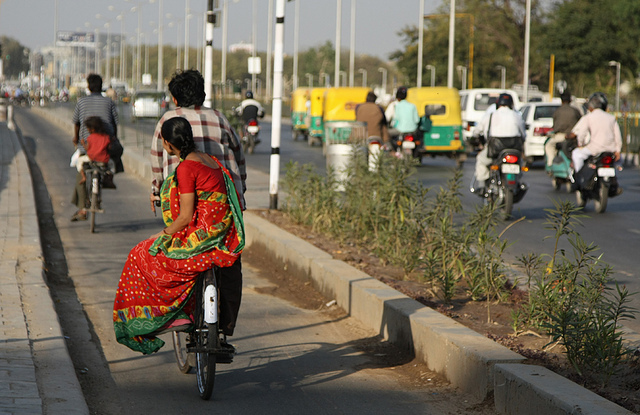 A woman enjoys a cycle lane on Ahmedabad's Janmarg system. Photo by Meena Kadri. Today is International Women’s Day, dedicated to the economic, political and social achievements of women past, present and future. Women have made much progress in society, but there are still many injustices and inequities to tackle, especially in the realm of transportation. In 2007, for example, the Manhattan Borough President’s Office found that 86 percent of public transportation riders who said they had been sexually assaulted did not report it to the police. Granted, women are not exclusively the victims of sexual assault, but women do comprise the majority of this group. Minneapolis is certainly moving full speed ahead in its support for cycling. NiceRide is expanding its stations; the city is considering hiring a full-timecycling & pedestrian coordinator; bike lanes are freshly restriped in bright green (at least in Dinkytown, anyway); and last year Minneapolis surpassed Portland as the nation’s #1 biking city. As an urban enthusiast, ardent supporter of Minneapolis’ pro-cycling efforts, and downtown resident, I should be excited to be biking every day in my city. But I’m not! I walk, or drive, for all my trips. But I don’t bike. I am afraid of being hit by cars, that’s why! Dewan Chowdhury, who owns Buffet Moni Mahal on Laurier between Elgin and Metcalfe, says he's taking in about $15,000 less a month due to parking issues on the street. He suggests the bike lanes should be moved to another street, so customers can park on one side of Laurier. Ottawa City Hall must have figured there was a good chance that segregated bike lanes on Laurier Avenue would hurt businesses along the downtown street. But when the city is bent on doing something "green," as it was with the bike lanes, turning a blind eye helps push through the agenda quickly. After all, it wouldn't listen to residents on Laurier, who were extremely vocal over the loss of most of the street's parking spots to accommodate the bike lanes. For months now, businesses - restaurants for the most part - have experienced a huge drop in revenues because the lack of parking has kept customers away. That darn pesky bike lane (juleskills's flickr). The Wall Street Journal may have announced earlier this summer that the bikes have won but don't tell that to the paper's scruffy sibling the Post. That tabloid, like some Upper East Side community boards, thinks the battle is still on and today anti-bicycle zealot Steve Cuozzo has posted another report from the front line: Broadway between Columbus Circle and Times Square, where the bike lanes are supposedly murderingbusinesses. Though murder is probably too strong of a word, even if Murdoch's minions used for their headline, as Cuozzo doesn't cite any actual closures. What he does cite are a handful of business owners who tell him "in guarded but passionate terms" of "lost business they may never be able to recoup." For instance Stephen Hanson, whose restaurant group B.R. Guest owns Ruby Foo's at Broadway at 49th Street, complains that the paths and the pedestrian arcade that came with them have "hurt our business there tremendously. There's no walk-by traffic we used to have at night, because everybody's in a mad dash to get to the central arcade area." Editor's Note: This is from April 2011. - My fear about the current initiative in Columbus is implementation. If the proposed bike lanes are going to follow the precedent of the few existing lanes in Columbus then we will end up with issues. In the wake of yesterday’s cyclist death near the University of Minnesota, I pointed out that the bike lanes near along 4th and University do not seem to meet current accepted standards for width, although I’ve not personally measured them.Twin Cities Sidewalks observes that the post-tragedy discussion is likely to center on bicyclist and pedestrians being careful, rather than touching off a much-needed discussion of the poor roadway design in the University and Dinkytown areas. Twin Cities Sidewalks is right. High-speed roadways through the heart of campus, with or without bike lanes, are dumb, yet that’s what University, 4th and even Washington Avenue amount to. The bike lanes are built such that campus buses will migrate in and out of the bike lane at spots to pick up and discharge passengers. The lane placement encourages cyclists to overtake motorists on the curb side and requires skilled lane passage to make left turns. Lanes also set up numerous right-hook opportunities, placing the bike lane to the right of potential right-turning vehicles. This is especially obvious and serious near I35-W, but is true throughout the campus area. The number of opportunities for life-changing accidents is pretty huge. One of the best things about seeing a cit by bike is feeling the wind in your hair while you explore diverse neighborhoods, such as Washington, DC's Chinatown, pictured here. Editor's Note: Check out Yay Bikes! Year of Yay rides to explore Columbus, Ohio. A performance touring bike that can handle cargo, mud, snow and cobblestones. We have many different options for the commuting bike. Pounding the pavement, jumping curbs and high-tailin’ it into work or just the coffee shop - the Viaje will deliver. This is a bike designed to be comfortable while still earning you some style points with the endless array of customization. After helping thousands of cyclists, the folks at Third Hand Bicycle Cooperative are now looking for a little assistance themselves. The nonprofit group has outgrown its space at 174 E. Fifth Ave. Gentrification has hampered the search for a new location within its Weinland Park-area home because most of the good properties have already been snatched up. “We’re finding almost every property is spoken for, even if they’re vacant,” said Reda Ashour, outreach coordinator for the group. From its roots, operating out of a basement on 15th Avenue, today’s core members of Third Hand trace their history to 2005 when they first opened to the public out of a residential garage in Clintonville. "Bicycle Dreams" Submission - Rob H.
"Bicycle Dreams" Submission - Joshua H.